Breed Group: Mastiff Weight: 54-66 kg (120-145 lbs) Height: 58-76 cm (23-30 in) Feature: It reaches its full height at one year old and its full weight at two years. French Mastiffs have short, muscular bodies with huge, wrinkly heads. They have a short muzzle, brown nose, and light eyes. Smaller Bordeaux Bulldogs are sometimes referred to as ‘Doguins’. Coat: The French Mastiff has thick, wrinkly skin and a short, soft coat which comes in shades of fawn to mahogany. It has a black or red mask and possible white markings on the chest and toe tips. The French Mastiff is an average shedder. Character: Loyal and devoted to its family, the Bordeaux Bulldog is fearless and proud. It is gentle with children and family members, kindhearted, and sometimes gullible. French Mastiffs make excellent watch dogs and guard dogs. They do tend to snore and sometimes drool. 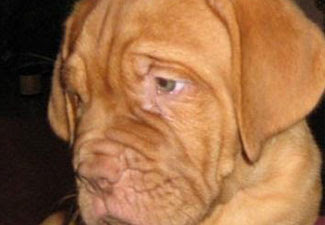 Temperament: The French Mastiff is calm and patient. It should be well socialized with other animals from an early age. French Mastiffs have a patient, gentle temperament, however they are suspicious and confrontational with strangers and sometimes aggressive with other dogs, especially males. Activity: Bordeaux Bulldogs require a lot of exercise, but are very inactive indoors. They need either a yard to play in or a daily walk. Apartment life is suitable for the French Mastiff.